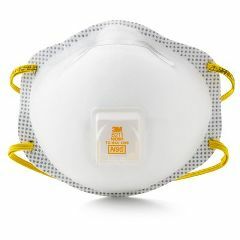 AllegroMedical.com presents The 3M N95 Particulate Respirator w / Valve & Faceseal Mask with Ear Loops. The lightweight, disposable N95 particulate respirator is designed to help provide quality, reliable worker respiratory protection against certain non-oil based particles. 3M uses a variety of innovative features to help you meet your respiratory protection and comfort needs. The respirator incorporates 3M's proprietary technology with advanced electrostatically charged microfiber filter media, designed for ease of breathing. The soft inner material provides added comfort while the cup shape design makes the respirator spacious and durable. These features, along with the face seal, braided headbands and adjustable M-noseclip, are designed to help enhance user comfort and increase wearability. The proprietary 3M™ Cool Flow™ valve is designed to release your hot, humid exhaled breath quickly, helping to prevent an unpleasant build up of heat inside the facepiece - a significant cause of discomfort to respirator wearers. The Cool Flow valve’s efficiency in keeping breathing cool and comfortable has been demonstrated through testing: the atmosphere inside a respirator with a Cool Flow valve is on average 7.5°F cooler than the similar product without the valve. This makes Cool Flow valved respirators ideal for long periods of wear, especially where conditions are hot, humid or physically demanding. Adjustable M-noseclip reduces potential for eyewear fogging and helps ensure a secure seal and fit. Braided headbands two-strap design with dual point attachment helps provide a secure fit. Suggested applications: Ideally suited for work settings that involve heat, humidity, or long periods of wear.